There is just nothing more convenient than staying in a cabin with the access to instant entertainment under your own roof! If you are an early riser, start your morning off by practicing your billiards skills in the game room. However, if you are the night owl of the family, stay up late checking out the latest video game action. There is always something to do in your cabin when you have access to our cabins in Pigeon Forge with game rooms! You actually save a significant amount of money when booking one of our affordable cabins with a variety of games and pool tables! If you chose a hotel for your vacation to Pigeon Forge, you would need to spend money on activities in town to keep you occupied and entertained. However, there is no need to extend your vacation budget for additional entertainment when you have all the fun you need in your cabin! Although we hope that you have a vacation full of lovely weather, mother nature can often be unpredictable! If you do happen to experience some rain or other inclement weather, you have an awesome game room to easily pass several hours or more. You’ll be surprised how quickly time can pass when you are engrossed in a challenging game of pool or a foosball competition! Before you know it, the weather will have improved and you’ll be back to enjoying the great outdoors. We know that children can sometimes have a short attention span and it can be difficult for parents to keep them constantly entertained while on vacation. However, don’t worry about that when staying in a cabin with a game room at Heritage Cabin Rentals! As soon as your kids walk into the cabin to find unlimited access to video games, pool tables and more, you’ll have a tough time getting them OUT of the game room! One of the great things about our game rooms is that they bring families together in a fun atmosphere to create incredible vacation memories. Spend an afternoon teaching the kids how to shoot pool or have them give you a lesson on how to defeat the latest video game villain. Have a family pool tournament to wind down after a day of exploring Pigeon Forge and enjoy being together in the unique environment of our game rooms! 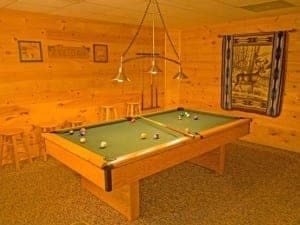 Check out our cabins in Pigeon Forge with game rooms to book your vacation today! We hope to see you soon in the cabins with game rooms from Heritage Cabin Rentals!